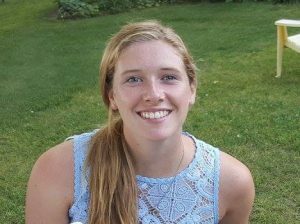 My name is Nora O’Leary and this summer I am working at HOPE, a non-profit organization that provides food, clothing, and resources to low-income and homeless families in Addison County. HOPE has a food shelf, which is available to families once a month, and a surplus area stocked with day-old food from Hannaford’s supermarket and other generous locals. The organization earns money from sales at their thrift shop, Retroworks, which they use to aid families with a variety of expenses, from heating bills, to laundry vouchers, to car repairs. HOPE also provides assistance to homeless individuals with basic necessities, camping supplies, and with the difficult transition out of homelessness. Because HOPE is not a government-affiliated organization, the staff is able to be flexible and provide financial assistance based on a person’s needs at any given time rather than following strict guidelines. That means there is a lot of personal interaction with the clients, because the staff seeks to hear everyone’s stories and understand their struggles, in order to help them in the most effective way possible. As HOPE’s receptionist this summer, I have had the opportunity to have the initial contact with every client who walks in the door, hear their stories, and figure out how best to help them. This entry was posted in Midd Blogosphere and tagged addison county, internship, Internships, privilege & poverty, Reflection, shepherd, Uncategorized on August 18, 2016 by Sarah Karerat. With the Open Door Clinic, I have become aware of a whole new community that exists in Addison County of which I was not previously aware. In Addison County, roughly half of residents are uninsured. While most of us can go into a hospital and show an insurance card to avoid heavy fees, many Vermonters are left staring down big hospital bills with very little means through which to pay them. However, the issue is not even this simple. For migrant workers in Vermont, many do not understand the system and, when they receive their bills, do not quite know what to do with them since they are not in their native language. This is just one issue that I have been confronted with and helped alleviate through proactive communications with patients. While these problems are large scale, and will therefore need solutions on such a scale, I can still feel that my contribution has been worthwhile: helping a migrant worker, who provides for his small family that he started in Vermont, get his bills paid can be an experience that would be far more significant than one had serving my superiors coffee as an intern on Wall Street. In the future, I see myself doing work that will help people, not because of their economic or social advantages but because we owe people help because of their humanity. At the Open Door Clinic, my coworkers have been consummate professionals in refraining from judging patients. In this line of work, we must become pure assets that always work for the benefit of our patients. In this sense, the job becomes all the more fulfilling through intentional service in which we deny ourselves our own wishes. This type of job has been very fulfilling for me and my coworkers have been role models for me to teach what it means to serve those that are marginalized in our communities. This entry was posted in Midd Blogosphere and tagged addison county, internship, Internships, privilege & poverty, Reflection, shepherd, Uncategorized on August 15, 2016 by Sarah Karerat. 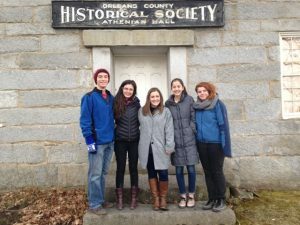 Kyler Blodgett ’17 writes about his experience on a LiM-Mini-MAlt trip this spring break to Orleans County and the Northeast Kingdom of Vermont with four other Middlebury students. “The five of us piled into the van early on the Tuesday morning of Spring Break, wondering if we had remembered all the USBs, international candies, and travel knick knacks for the next three days. 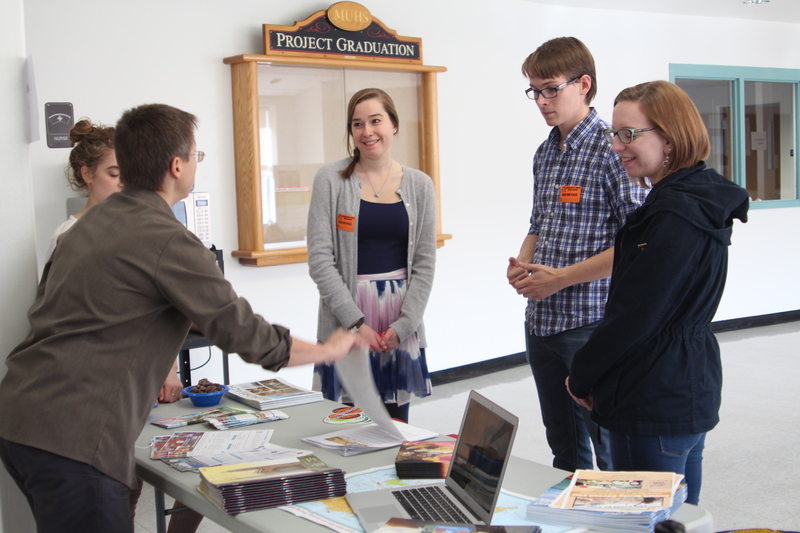 We were headed 100 miles north of campus to Orleans County and the Northeast Kingdom of Vermont to deliver interactive presentations focused on global awareness and cultural relativity to students in the area. The Kingdom, as it’s called locally, is known for beautiful scenery with a low population, even relative to the rest of the state. Social services and employment options tend to be limited, but prospects of moving out of the area are low. With this context in mind, we had spent the previous two weeks preparing our presentations. Trained by Kristen Mullins, director of the Language in Motion program on campus, we all based the presentations in our personal experiences living or studying abroad. The countries in our group included England, Ireland, France, Germany, China, and Cameroon. As it is with many short service-learning trips, we hit the ground running. Our first afternoon in the Kingdom we presented at Brownington Central School, a K through 8 school with about 15 students per grade. There was a nervous energy among us as we met the principal and were given a tour of the small building; though many of us had worked with kids previously, the prospect of being handed the reins of a classroom either in pairs or solo was still daunting. We didn’t reconvene as a whole group until the school day ended two and a half hours later, but the nervousness had clearly vanished long before that. We shared stories of the students’ perceptiveness, and anecdotes of way the young kids focus on the most unpredictable details that is equal parts lovable and frustrating to a teacher. Over a homemade dinner, we reflected on our gratitude that the kids were not hesitant to ask questions or show interest in the topics, a “too cool for school” feeling we had expected. We wondered if we would get such an enthusiastic reception at the neighboring Lake Region High School the next day. Wednesday morning had a similar feeling of anticipation since it was the fullest and least centralized day of the trip. We met with Lake Region guidance counselors before the first class, a conversation that quickly turned towards the respective stereotypes the students have of internal cliques, foreigners, and often themselves. Though this knowledge made our presentation topics feel even more relevant, it gave us a pause to consider how we’d be received. Much like Tuesday afternoon at the Brownington, we were collectively surprised at the level of the kids’ engagement. 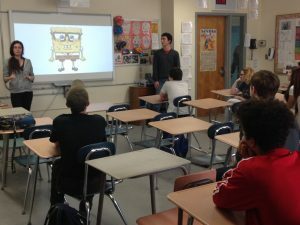 By second period, word had gotten around that college students were in the building and kids would often enter presentation classrooms and whisper excitedly. We saw little trace of the non-engagement counselors had warned us about; rather, students were very curious about our travels, and enthusiastic participants in simulations and discussions. In some of our most interesting moments, we were able to talk with the students about ways they thought outsiders stereotyped the Kingdom, and use that as a springboard to conversations about cultural relativity. The students brought an energy to activities that was contagious even when our own fatigue began to catch up with us in the afternoon. Our group met up after the last bell rang with grins on our tired faces. We’d had two early mornings in a row, but the learning wasn’t done yet. We were lodging at the Old Stone House Museum not far from the schools, and the museum director gave us a tour that afternoon. 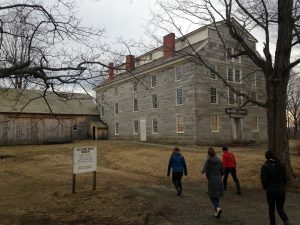 She walked us through the fascinating history of the Old Stone House as a progressive boarding school run by Midd alum, Alexander Twilight, from 1829 to 1847. Before driving back to Middlebury on Thursday, we met with the director of the Teen Center at NEKCA (the Northeast Kingdom Community Action association), a hub of local social service providers. In a conversation that was both lively and frank, director Allyson Howell talked to us about the realities of running the Teen Center on a shoestring budget, and the difficulties facing youth in the Kingdom. These included the location as a notorious drug highway from New York City to Canada, homelessness, and rural transportation obstacles. Learn more about Middlebury Alternative Breaks Trips at go/MAlt and about the Language in Motion program at go/LiM. This entry was posted in Midd Blogosphere and tagged A student's voice, Language in Motion, MAlt, Reflection, Student Stories, Uncategorized, VT classrooms on April 21, 2016 by Alison Haas. This past February break, six groups of Middlebury students escaped the wintry Vermont weather, traveling as many as 3,000 miles to six respective locations around the globe. Middlebury Alternative Break Trips, affectionately referred to as MAlt trips, are service-oriented experiential-learning trips. This year the 50+ MAlt participants traveled to Guatemala, Washington DC, Mexico, Puerto Rico, Miami, and New York City, and addressed issues ranging from permaculture to privilege and poverty in vastly diverse local communities. “The trip was eye-opening and life-changing […] I intend to try to lead a MAlt trip myself, motivated by how powerful and influential and rewarding this trip has been,” one MAlt Washington DC participant said. Returning to campus, many students remarked that their MAlt trip has left an enduring mark on them. As students reflected on their rich experiences and personal growth, they also explored the ethics of service and development work. What role does service play in a community? How can we responsibly contribute to a community that is not our own? What is sustainable service and development? How can we unpack our own privilege in relation to certain communities based on identities of race, class, gender, nationality, ethnicity, sexuality, and so on? How can we best learn from each other? Read on: MAlt participants will answer these questions, explain the ins and outs of travel in-country and abroad, talk small group dynamics and new friendships, and tell of the challenges and lasting benefits of volunteerism and service. Dylan Gilbert and Mariam Khan, both class of 2017, wrote about their trip to Mexico and the opportunity it afforded an unlikely group of students to get to know each other. Dylan Gilbert is an Art History and Russian double major from St. Peters, Missouri and Mariam Khan is a student of Math, Religion, and Education Studies from Waterville, Maine. Dylan, Mariam, and other MAlt Mexico participants also reflected upon certain challenges that the group faced, from linguistic capabilities to the politics of international tourism. Similar to the reflections of MAlt Mexico participants, a MAlt Puerto Rico participant noted that, “This trip was useful in informing me on culturally-appropriate service abroad.” This learning, however, certainly came with challenges, even if small ones. On the MAlt Miami trip, for instance, showering at night in an outdoor shower and staying in a low-income neighborhood posed an adjustment for some of the participants. So, what do you say? Will you be next? Will a life-changing MAlt trip be part of your 2016 or 2017? Learn more about Middlebury Alternative Break Trips at go/malt and view photos from this year’s trips on Facebook. This entry was posted in Midd Blogosphere and tagged A student's voice, gratitude, international experience, MAlt, new experience, new friends, News & Events, privilege & poverty, Reflection, service, Student Stories, Uncategorized on March 8, 2016 by Alison Haas. Do you have an intercultural passion? Are you an upper-level language student with cultural awareness? Have you returned from study abroad or spent time abroad? Language in Motion (LiM) is an educational collaboration that connects Middlebury’s international, study abroad, and upper level language students with local high school and middle school teachers, students, and classrooms. With support and training, Middlebury College students prepare and deliver lessons that promote global awareness, cultural competence, and world language acquisition. LiM presentations are designed to support the host teacher’s learning objectives. School-age children gain new exposure to diverse culture, language, and experience, and the opportunities that college can offer. Middlebury College students gain exposure to the secondary teaching environment and deepen their international and intercultural experience through personal and shared reflection. Language in Motion is currently accepting applications for fifteen presenter positions for the spring semester. There is an optional information session this Thursday, February 25 at 7:15 in the Community Engagement Office at 118 South Main Street (behind the library). Applications and more information can be found at go/lim, or on Facebook at facebook.com/middlim. This entry was posted in Midd Blogosphere and tagged apply, foreign language, international experience, Language in Motion, News & Events, Reflection, study abroad, Uncategorized, VT classrooms on February 23, 2016 by Alison Haas. The end of January is approaching which means we’re also coming to the end of National Mentoring Month! National Mentoring Month, NMM for short, was created by the Harvard T.H. Chan School of Public Health and MENTOR in 2002. This month aims to focus national attention on the need for mentors, highlighting how we all – individuals, business, government agencies, schools, faith communities, and nonprofits – can do our part. For the past 14 years, NMM has celebrated mentoring and the positive effect it can have on young lives with the goals of 1) raising awareness of mentoring in its various forms, 2) recruiting individuals to mentor, and 3) promoting the rapid growth of mentoring by recruiting organizations to engage their constituents in mentoring. This year, NMM’s theme is “Mentor in Real Life”, lending way to discussion of mentoring’s real life benefits. In Vermont, the organization Mobius: Vermont’s Mentoring Partnership is an NMM ambassador. This month works to celebrate and set apart the special role that mentors play in the lives of others through various events and days of gratitude. All the while, we must remember that our involvement, gratitude, and excitement for volunteerism and mentorship cannot be contained to a single month, and instead carries us throughout the entire year. So, with one week left to this special month, go forth: thank the mentors in your life and consider stepping up as a mentor in the life of someone else! This entry was posted in Midd Blogosphere and tagged community, gratitude, Mentoring, News & Events, Reflection, Uncategorized on January 22, 2016 by Alison Haas. 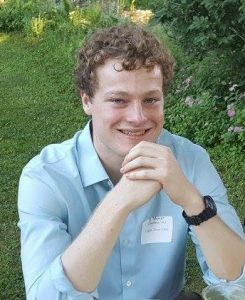 “Spending time out of the United States and learning foreign languages have been instrumental in shaping my worldview and my academic path at Middlebury. Participating in the Language in Motion program through the Office of Community Engagement has given me the chance to combine my love for languages and intercultural exchange with my interest in education. LiM facilitates connections between Middlebury College students who have had international experiences, through study abroad, summer programs, gap years, or by virtue of being international students, with secondary school students in Vermont. It gives Middlebury students the chance to make their abroad experiences meaningful in new ways and to reflect on how the insight they have gained through their international experiences can be valuable to the larger Middlebury community. 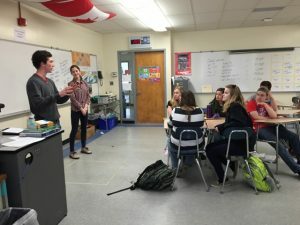 Midd students participating in LiM go through training to plan and give presentations to high school and middle school students in the area on an aspect of their international experience. Topics range from superstitions in Russia to foods of Spain to life in Ethiopia. This entry was posted in Midd Blogosphere and tagged Language in Motion, new experience, Reflection, Student Org Profiles, Uncategorized on November 18, 2015 by Alison Haas.